Here, we report a child who developed progressive neurological deterioration and severe back and leg pain subsequent to large infected dermoid tumor extending underneath the skin to the spinal canal and intramedullary area. A 3-year-old boy was referred to neurosurgical department because of severe back and leg pain and motor regression. He was a known case of lumbar MMC and was operated at 8 months of age. He was shunted for progressive hydrocephalus 3 weeks later. He could sit at 11 months of age and stand at age of 2 years on his knees, but could not move the distal part of his legs at all. His back pain had started 3 months ago, which was severe at night and made him unable to sit. Subsequently, he experienced severe leg pain, which prevented him from moving the proximal part of his lower extremities and his mother faced difficulty while cleaning him after urination or defecation. On physical examination, the child was afebrile, but very irritable, with good mental performance, and normal neurological examination of upper limbs. Both lower extremities had lost any movement in proximal and distal parts (0/5). Deep tendon reflexes were absent in both legs. Sensory level was undetectable because of the child's uncooperation. He was incontinent for urine and feces. A small tender bulging was identified in his back under the MMC repair incision for one week before admission, but no dermal sinus was found inside or around the incision. Spinal Magnetic Resonance Imaging (MRI) was performed one month before surgery, which revealed cord tethering (cord at L4- L5level). Distal cord was attached to a mass, which was isointense in T1- and hypointense in T2-weighted images. It was extending from distal cord through the bony defect to the extraspinal canal space. The cord was dilated from the level of tethering to L1level with a lesion, which was isointense to hypointense in T1- and hyperintense in T2-weighted images, dissimilar to the intensity of cerebrospinal fluid [Figure 1] and [Figure 2]. The child underwent surgery with the suspicion of tethered cord associated with an inclusion tumor. In the prone position, the prior midline vertical incision was opened. During the dissection of subcutaneous tissue, fine hairs and white yellow creamy collection were drained spontaneously with high pressure. This lesion was extending through the previous spinal posterior element defect into the cord. Dura mater, cord and dermoid tumor were attached to each other at the depth of previous surgical field, and the tumor was extending from the extraspinal area to the intramedullary space between L4 and L1 vertebral levels. Access to the whole lesion was possible with osteoplastic laminotomy of L1 to L4. Dura mater was severely tense at the level of L2-L4. Microsurgical release of all intradural adhesions was performed to achieve circumferential untethering of spinal cord associated with gross total resection of intramedullary mass. Complete excision of the dermoid cyst and capsule were performed, which was followed by primary closure of the dura. On histopathological examination, specimen had the characteristic features of a dermoid cyst, with simple squamous epithelium, hair follicles, and cholesterol-containing debris. The material was sent for culture, which was positive for Klebsiella. The postoperative period was unremarkable. He underwent intravenous antibiotics therapy with cefotaxime and amikacin for 4 weeks. The pain recovered postoperatively. He could move proximal part of his lower extremities with score of 1-2/5, but was unable to stand on his knee as he could do before. His sphincter problem remained unchanged. Children with MMC are born with a wide range of neurological deficits that will remain after primary repair of lesion. Any new changes in the previous neurological, urological or orthopedics status warrant an extensive investigation to rule out the possible causes, especially tethered cord syndrome. Dermal sinus tract as a rare congenital abnormality is accompanied by inclusion tumors in 43% of instances, wherein most tumors are dermoids. , Infected dermoid tumor or spinal abscess has been observed with dermal sinus tract. Intramedullary spinal abscess without sinus tract is extremely rare, but a devastating condition in children. ,,,, Intramedullary abscess and dermoid tumor without dermal sinus have been reported before;  however, not following MMC repair and especially not associated with tethered cord. In order to explain infected dermoid tumor in this patient with prior MMC repair, we propose several explanations. Implantation of bacteria during closure of MMC sac can lead to abscess formation but occurence three years after the first surgery seems to be unusual. Microscopic sinus tract through the preceding MMC surgery incision can be a way for bacteria to reach the subcutaneous space. Hematogenous superinfection of the dermoid cyst during repeated urinary tract infections in MMC patient is another possiblity for abscess formation in this case. Dermoid tumors, even infrequent, should be considered in the differential diagnosis of the causes of neurological deterioration in patients with a history of MMC repair. Along with tethered cord syndrome, dermoid tumor can complicate the prior neurological and physical status of the child, and should be searched vigilantly during evaluation of these patients. Because of rapid growth of dermoid tumors and associated infection, these can deteriorate the previous neurological status in a more aggressive and destructive manner as compared to tethered cord per se. Awareness of such pathology in patients with previous history of myelomeningocele repair, early diagnosis and surgical intervention can provide better result with less disability. Tethered cord syndrome should be investigated in any patient with a history of MMC repair if one finds neurological, orthopedics, or urological deterioration. Dermoid tumor is considered as an important differential diagnosis during thorough evaluation of the causes of worsening. In order to minimize the risk of dermoid tumor development following MMC surgery, any residual epidermal or dermal elements should be resected from the neural placode. The operative field should be explored accurately proximal and distal to the sac to find any associated anomaly or minute inclusion tumor and prevent late inclusion tumor formation and tethered cord. 1. Steinbok P, Irvine B, Cochrane DD, Irwin BJ. Long-term outcome and complications of children born with meningomyelocele. Childs Nerv Syst 1992;8:92-6. 2. Herman JM, McLone DG, Storrs BB, Dauser RC. Analysis of 153 patients with myelomeningocele or spinal lipoma reoperated upon for a tethered cord. Presentation, management and outcome. Pediatr Neurosurg 1993;19:243-9. 3. Storrs BB. Are dermoid and epidermoid tumors preventable complications of myelomeningocele repair? Pediatr Neurosurg 1994;20:160-2. 4. Kalia V, Aggarwal T. Holocord intramedullary abscess. Indian J Pediatr 2007;74:589-91. 5. 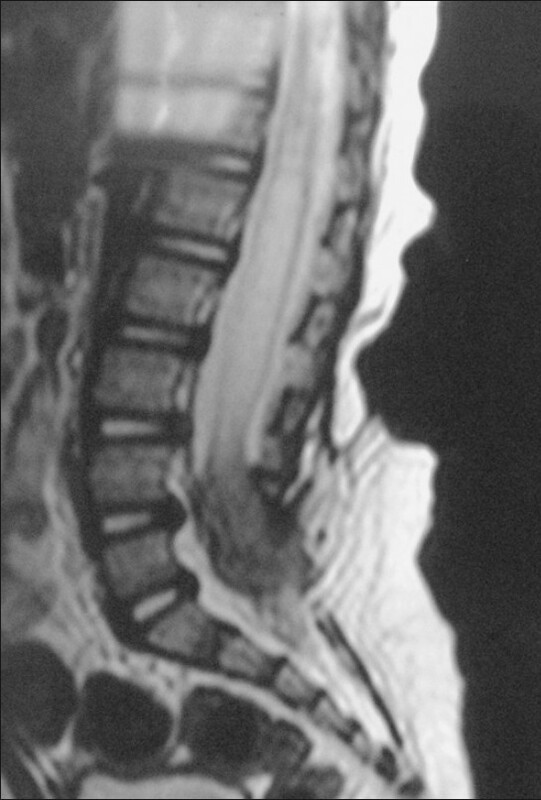 Gerlach R, Zimmermann M, Hermann E, Kieslich M, Weidauer S, Seifert V. Large intramedullary abscess of the spinal cord associated with an epidermoid cyst without dermal sinus. Case report. 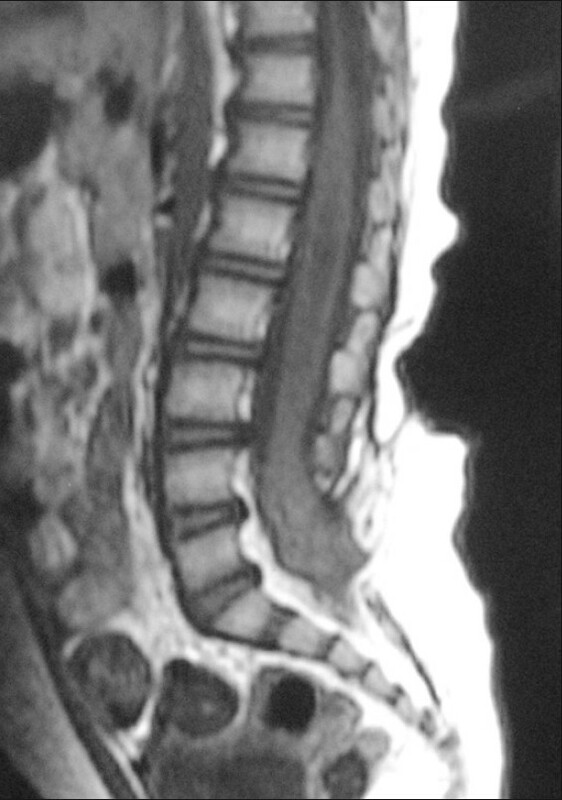 J Neurosurg Spine 2007;7:357-61. 6. Amacher AL. Intramedullary epidermoid associated with an intramedullary spinal abscess secondary to a dermal sinus. Neurosurgery 1992;31:979. 7. Benzil DL, Epstein MH, Knuckey NW. Intramedullary epidermoid associated with an intramedullary spinal abscess secondary to a dermal sinus. Neurosurgery 1992;30:118-21. 8. Bale PM. Sacrococcygeal developmental abnormalities and tumors in children. Perspect Pediatr Pathol 1984;8:9-56. 9. Nelson MD Jr, Bracchi M, Naidich TP, McLone DG. The natural history of repaired myelomeningocele. Radiographics 1988;8:695-706. 10. Mazzola CA, Albright AL, Sutton LN, Tuite GF, Hamilton RL, Pollack IF. Dermoid inclusion cysts and early spinal cord tethering after fetal surgery for myelomeningocele. N Engl J Med 2002;347:256-9. 11. Radmanesh F, Nejat F, El Khashab M. Dermal sinus tract of the spine. Childs Nerv Syst 2010;26:349-57. 12. Al Barbarawi M, Khriesat W, Qudsieh S, Qudsieh H, Loai AA. Management of intramedullary spinal cord abscess. Experience with four cases, pathophysiology and outcomes. Eur Spine J 2009;18:710-7. 13. Morimoto K, Takemoto O, Nakamura H, Takeuchi M. Spinal dermal sinus associated with intramedullary abscess and dermoid. Pediatr Neurosurg 2003;39:225-6. 14. Bunyaratavej K, Desudchit T, Pongpunlert W. Holocord intramedullary abscess due to dermal sinus in a 2-month-old child successfully treated with limited myelotomy and aspiration. Case report. J Neurosurg 2006;104:269-74. 15. Tsurubuchi T, Matsumura A, Nakai K, Fujita K, Enomoto T, Iwasaki N, et al. Reversible holocord edema associated with intramedullary spinal abscess secondary to an infected dermoid cyst. Pediatr Neurosurg 2002;37:282-6. 16. Desai KI, Muzumdar DP, Goel A. Holocord intramedullary abscess: An unusual case with review of literature. Spinal Cord 1999;37:866-70. Pu, K., Zhou, Y., Cheng, Q.-S., Li, Q.-G., Yan, X.-J.